Why choose a Goodman Rental? Goodman offers two different types of air conditioning systems that you can rent from us: split systems and packaged units. an outdoor unit that contains the condenser and compressor. If you have a home with a furnace but no air conditioner, a split system is often the most economical choice. More info about our HVAC rental program and features here. A packaged unit has the condenser, compressor and evaporator coil together in one unit located either on a concrete slab adjacent to the property or on the roof. This is a common system in small commercial properties. Packaged units often come with electric heating coils or a gas furnace and eliminates the need for an indoor furnace. A high and low pressure switch – a high pressure switch prevents the unit from working at extreme high pressures by shutting off the compressor circuit if the pressure exceeds the rating. A low pressure switch protects freezing from working its way to the compressor when the system works at lower than normal pressures. Cabinet air leakage at less than 2.0 per cent – the more air tight the unit the more efficiently it will run. A well insulated unit will also run quieter. Factory installed suction line accumulator – this feature protects the compression line from a sudden surge of liquid refrigerant or oil. In addition to packaged units, Goodman also offers central air conditioning units featuring factory installed filter driers. These help filter and absorb system contaminants. Louvred coil guards assist in protecting the coils from elements such as lawn equipment and extreme weather. Goodman’s heat pumps also feature factory installed filter driers, louvred coil guards and they also feature contractors with lugs. Both the air conditioning units and the heat pumps feature these which assist in connecting the units with quick and solid wiring. Multi-speed PSC (Permanent Split Capacitator) blower – this provides better energy efficiency and lowers noise levels compared to a single speed blower. Up to 98 per cent AFUE (Annual Fuel Utilization Efficiency) – means that 98 cents of every dollar you spend goes directly towards heating your home. Although the value of the Goodman product line is well known, many feel they are not able to afford this quality in their home. In the past this may have been true, but now there is a new way to get top quality HVAC products in your home. Instead of putting off getting energy efficient quality products in your home, why not take advantage and lower your energy bills today? 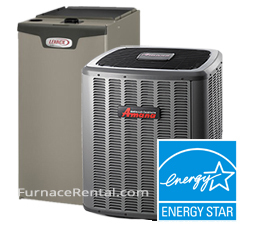 A simple phone call is all it takes to get a brand new, high quality rent to own Goodman furnace or air conditioner in your home, often as soon as the next day. Sound too good to be true? It’s not! Instead of spending thousands of dollars upfront or having amazing credit to finance, why not take the option that requires NO UPFRONT COSTS and FLEXIBLE APPROVAL. With a simple phone call you can get your brand new heating or cooling system installed for FREE as soon as the next day (all you pay is the low monthly rate!). We will install your equipment for free with up to 15 feet of venting. We will even dispose of your old equipment at no additional charge. Actually you should be looking at what your potential savings are. When you look at rising energy costs switching to a higher efficient heating or cooling unit can result in monthly savings. By upgrading your heating or cooling system, you are also adding value to your home, which is incredibly attractive in the hot real estate market. When you rent rather than purchase your system you are still eligible to apply for government rebates. Just make sure to research these grants beforehand to make sure you follow all the steps to qualify. By choosing to rent instead of buy your next unit, you are also buying peace of mind. Your low rental fee not only includes your Goodman high efficiency unit, but it also includes regular maintenance for your unit as well. That means that your furnace or air conditioner will be running at optimal efficiency long past installation, keeping your energy bills as low as possible. The savings don’t end there. If anything were to go wrong with your system you simply call the emergency line, available 24 hours a day, seven days a week. By having this system at your disposal, you are able to get a technician to your home without having to call around for the lowest price. The best part is that all your service calls are free. If our technicians can’t fix the issue, they will replace your unit, for free! Goodman began when a successful air conditioning contractor from Texas saw a need for high quality, low cost air conditioners and turned his attention to manufacturing. Having serviced HVAC units successfully for years, Harold V. Goodman, head of Goodman Manufacturing, knew the ins and outs of the industry. In a twist of fate, Goodman was able to take over the equipment from a similar HVAC manufacturer who was closing their doors and he began manufacturing central air conditioners and heat pumps. In 2012 Goodman was purchased by Daiken, a leader in HVAC technology. In order to fulfill a promise to keep manufacturing local and in country, the company invested in one of the most technologically advanced HVAC manufacturing centers in the world in 2014. Within this merger, the company began producing gas furnaces.